Find a new Jeep Compass at your local Anchorage, AK Jeep dealership. View NEW Jeep Compass Inventory	Looking for a USED Jeep Compass? Overview At Anchorage Chrysler Dodge Jeep Ram, we carry a great selection of Jeep SUVs, including the compact and affordably priced Jeep Compass. 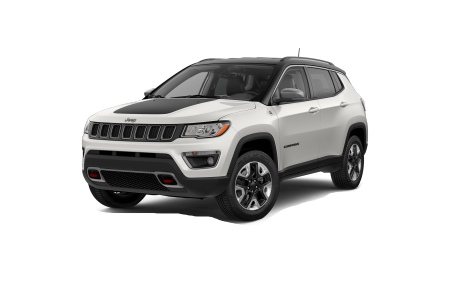 This SUV features a sporty exterior to showcase its all-weather, all-terrain attitude, and a comfortable interior with added technology and safety features to make the Jeep Compass the perfect adventure buddy. The Jeep Compass comes with the toughness the Jeep brand is known for, making it fully capable of taking on the Alaskan off-roads head-on. Take a test drive in the new Jeep Compass today. Why Us? When you shop with Anchorage Chrysler Dodge Jeep Ram, you can rest assured that you'll be treated with kindness and respect. Our team of automotive professionals is dedicated to assisting you throughout the entire car-buying process, without the hassle and pressure you may have experienced at other Jeep dealerships. Our vehicle sales associates will help you find the perfect Jeep SUV for your lifestyle, while our auto financing experts will customize your repayment plan to work with your budget. Visit us today in Anchorage, AK and see what we're all about. We look forward to meeting you! Regular off-road adventures means regular automotive service to keep your Jeep SUV running in peak condition. At our Anchorage, AK automotive service center, our team of certified car technicians are ready to handle any routine maintenance or unexpected repairs that you may need, including oil changes, parts replacements, transmission repairs, auto body work, and more. Swing by, give us a call, or fill out our convenient auto service appointment form to make a reservation, and we'll have you back on the road in no time.